Rossignol's new Pursuit HP replaces the popular Avenger Ti, taking over the maker's high-end frontside carver niche—non-race edition. Think of the wood/titanium-core Pursuit not so much as a race-stock relative but rather as a pedal-to-the-metal crowd-pleaser. The ski showcases Rossignol's mastery of next-generation Frontside design, with an 81mm waist and a very slightly rockered tip (let's call it early-rise) working together to deliver a versatile ride that is both balanced and lively. Turn initiation is effortless—disarmingly so. At first glance the Pursuit HP has an accommodating nature that might leave you thinking it's a little too soft at heart, but give it a push and the ski pushes back with considerable resolve. 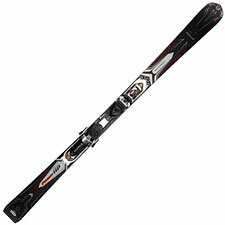 Put the ski through its paces, and you quickly come to realize that the Pursuit HP has an astonishingly broad range. The ski is forgiving enough for advanced intermediates, yet feisty enough to satisfy even hard-charging experts. Will amped-up ex-racers find it savage enough? Probably not. But everyone else in the advanced to expert carving category will find abundant reasons to love it. The Pursuit HP is particularly notable for its seamless marriage of new and old. In this case, the new is the Pursuit's modern geometry, and the old is that traditional feel and responsiveness on-snow that we all crave. We've enjoyed a brisk few years of ski design advances, to be sure, but those advances have all come with a considerable dose of weirdness. The Pursuit HP keeps the best performance enhancements of the modern era while still delivering a ride that feels, as they say, like a ski. This, to me, is the big news of the 2013 cohort, and Rossignol is absolutely at the head of the class with the Pursuit HP. On-snow I immediately noticed how balanced the ski is. You can stay centered over the middle of it and lay it over, letting the 16.8-meter turn radius do the work for you, or you can work the ski tip-to-tail without penalty. The Pursuit seems to adapt to whatever turn style you throw at it, rather than demanding you conform to its own ideas. At low speeds, the ski is quick and turny; ramp up the velocity, and the ski seems to grow bigger and stiffer underfoot, delivering an impressively solid ride. Compared to its peers (Frontside/Hard Snow) at the Winter Park SIA demo, I thought the Pursuit HP was a clear winner, outperforming everything else in its class, delivering a ride that seems to adapt in real time to meet your needs. Absolutely this is a ski to watch, and likely it will prove to be one of the best skis of the upcoming season.